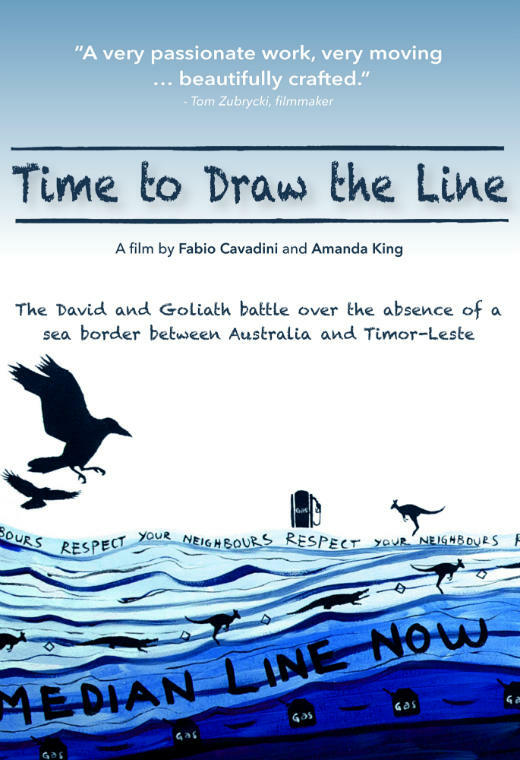 Australia Timor-Leste Friendship Groups are invited to promote and organise an event screening of this excellent documentary about the Timor Sea; Time to Draw the Line. You are strongly encouraged to organise such an event on or around the United Nations World Day of Social Justice on 20 February 2017 to coincide with simultaneous events organised by the Timor Sea Justice Campaign. In the lead up to the United Nations World Day of Social Justice on 20 February 2017, organisations and individuals are invited to promote and organise a screening of the documentary of Time to Draw the Line. It is hoped as many screenings as possible occur on this day. DEMAND.FILM is making the film available for single event cinema screenings throughout Australia that you, as the organiser can book. 10% of the total box office will go to the organiser of the event, or a charity of your choice. DEMAND.FILM will select the cinema, based on your postcode, for your screening and provide the details for bookings including among other things how to purchase tickets for the event. Approximately 60 people for each event is required depending on the size of the cinema. If by a particular date the minimum number is not reached DEMAND.FILM does not proceed with the event and no one is charged. DEMAND.FILM promote good causes through this arrangement, and this film’s producers and the Timor Sea Justice Campaign chose this as an effective way to reach a larger number of people. To organise and promote Time to Draw the Line, visit DEMAND.FILM (https://au.demand.film) to complete the Screening Request and submit it on-line. DEMAND.FILM will contact you and provide details on the event to assist you. The program is designed as a 90 minute cinema event including an animated documentary short – Jose’s Story and the main film, Time to Draw the Line running at almost 60 minutes followed by a 30 minute Q&A. Please consider organising a speaker to introduce the documentary and having a Question and Answer segment at the conclusion of the screening of the documentary. You might wish to be the speaker or Ms Janelle Saffin (details below) could suggest a speaker or try to be available if that was useful to you. Janelle has background notes to provide for you for your screening. If you have any questions, please contact Mr Alexander Weilsmann, Impact Producer, Time to Draw the Line as he is handling all the screenings. Contact Ms Janelle Saffin for availability of speakers or to obtain background notes/speakers notes for your screening. Time to Draw the Line – a documentary on the Timor Sea dispute between Australia and Timor-Leste. This compelling documentary conveys the principles of human rights and justice. It was these principles that saw the Timorese protect the men of Australia’s “Sparrow Force” in East Timor during the Second World War. During those few short years 40,000 to 60,000 Timorese were slaughtered by the Japanese Imperial Army for protecting our defence personnel. The Sparrow Force men, war widows and many Australian veterans today say “we owe the Timorese a debt of honour”. The world fell in love with East Timor when it became a new nation after 24 years of Indonesian occupation and war. The Australian lead International Force for East Timor (INTERFET) helped the Timorese secure peace after the 1999 carnage. Now almost two decades later, the chilling story of Australia’s relationship with this new nation must be told. Time to Draw the Line presents the campaign for East Timor’s desire to settle its maritime boundary with Australia. Interviews include Australians who are on the side (of the line) of the East Timorese and on the right side of history. Time to Draw the Line is directed and produced by: Amanda King and Fabio Cavadini with Associate Producers Ines de Almeida and Janelle Saffin. ‘Time to Draw The Line’ is essential viewing for understanding how the extraction of resources has, time after time, usurped our morals. It’s fantastic. A strong argument, but also a terrific study of a period of history too. Congratulations, it is a very significant work on this issue.